Step One: How to Draft Bracers. In this post, I draft a pattern for the Bracers of Gondor. 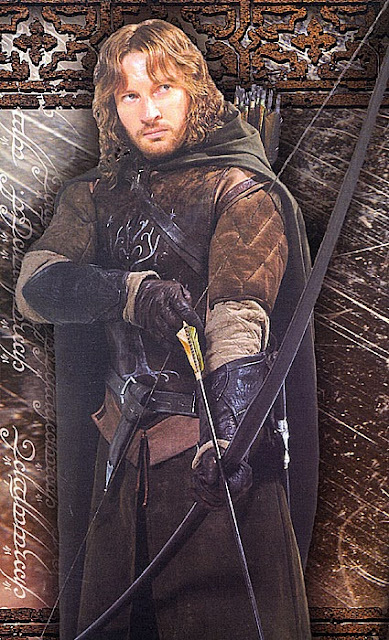 So, I always wanted to make bracers, especially since I had been planning for ages to make Gondor Bracers for Josh's Faramir Ranger outfit, and Link Bracers for Josh's Link Outfit. Sadly, I have no experience with tooling leather, and a very very limited budget. Then I stumbled across Andrea Schewe's tutorial for her pattern for making quilted bracers on the internet, and was greatly encouraged. While they're a far cry from the Vambraces of Gondor, they look pretty cool, and sewing is something I know how to do. I drafted my first pair on what seemed cool to me. I used canvas, felt, and broadcloath since it was just a test (all from my scrap box). I felt awesome, but they kept crawl up my arm toward my elbow. I decided it was from my hand flexing backwards, pushing on the point. See how it restricts wrist movement. 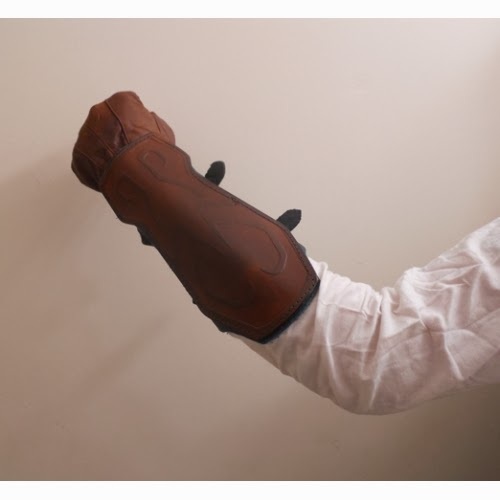 Restricts wrist movement, and pokes into upper arm. These are both not nice things to happen in combat, shooting arrows, etc. Especially when they are made from stiff leather instead of fabric. See how the "point" rests well below his wrist line. So I decided to make a pair with a straight wrist, with a hand guard attached to it. I also decided to make them a little longer to keep them from crawling down my arms. They were pretty awesome. The handguard rested a little too close, inhibiting my hand from bending backwards easily, but this is easily fixed by cutting both the wrist length, and the handguard at shallow U's where they meet, about a depth of 1/2"
So they were awesome, they didn't crawl down, but I found (wearing them all day) that they hindered my movement as well, when I bent my arm about, doing things, they cut into my upper arm. It was uncomfortable and I couldn't imagine wanting that in combat. So I went off to the internet to do my research. After studying lots and lots of pictures, this is what I found. Bracers are a lot shorter than they look. They weren't as long as I had previously thought. They are made so as not to hinder the elbow when bent. They are even shorter on the underside. 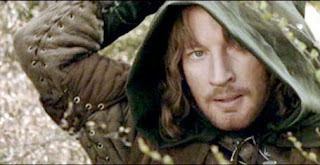 In this shot of Faramir, note how the bracer's point comes well below his elbow, even as he bends his arm it barely comes to the joint line. Also note how the "tip" at the wrist rests below his wrist line. Here again, we see where the bracer ends in relation to his elbow. Note that there's a gap between his upper quilted pauldron, and his bracer, to give better movement at his elbow. This is a Ranger Outfit after all, light armor, sacrificing protection for movement, speed, and stealth. After looking at tons of pictures, I decided that the underside of my bracer had to come at least a fist-width less than the measurement of my inner foream measured when my arm is at a 90 degree angle. 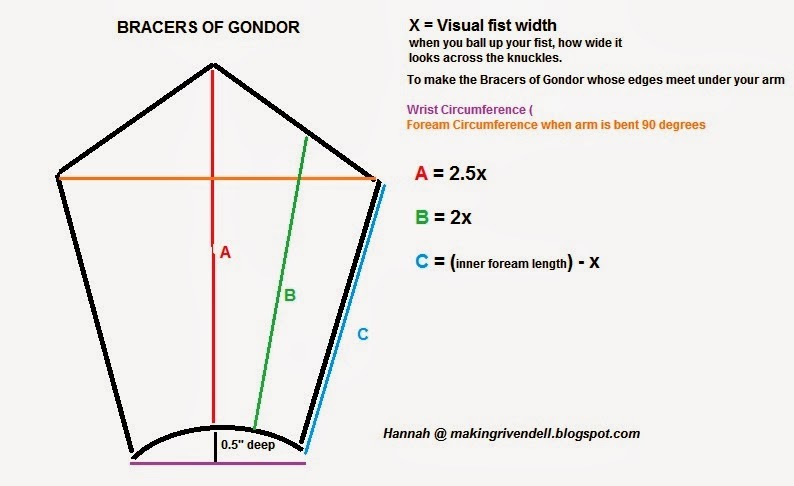 I also came up with some rough approximates of the dimensions of the the bracers of Gondor. Here's a diagram for the measurements. You'll also want to take the visual width of your fist. Make your hand into a fist, and measure across the knuckles at the widest point, with a straight ruler, to see how wide it looks. 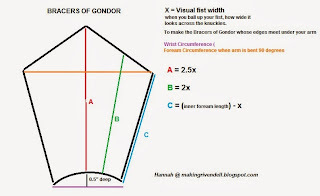 This is your visual fist width, which you'll use to get the dimensions for your Bracers of Gondor. This will be your "base pattern" bracer. You can make overbracers with gaps in the lacing, your can do all sorts of stuff to it to modify it. 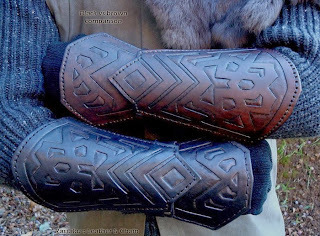 I would suggest making at least one set of "underbracers" with the base pattern, to get a feel for how to do it, before trying other fancy stuff. Here are more pictures of other kinds of bracers, which follow the same rules, that the bracers need to be atleast a fist-width away from your arm joint. Also, the unlaced bracer is wider than it is tall. Note, to get longer bracers, the angle changes. The underside is still kept short (atleast a fist length from bend in arm) but the bracer keeps extending to look longer on the 'topside'. 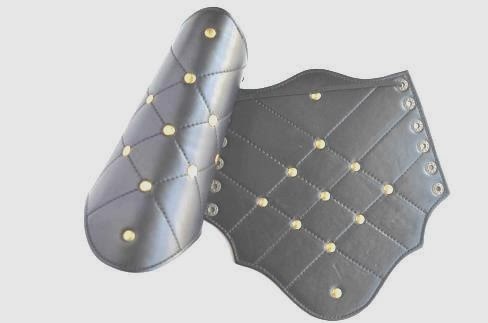 Warrior Greaves from Viking Shield. 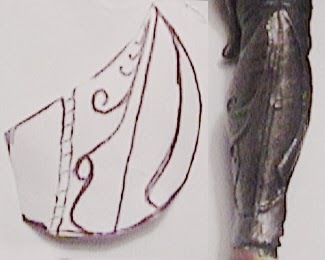 Note again, how the bracer is even wider than it is tall, because the laced up opening is techinically part of the width. 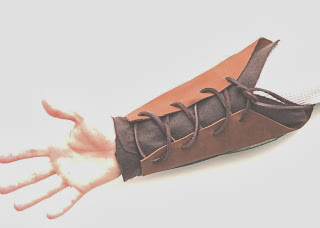 Last of all, a way to get the long bracer look. 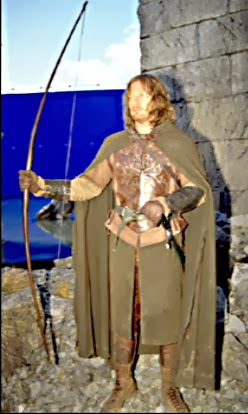 This is a picture of Jedi Elf Queen's recreation of the metal vambraces of Haldir's Archers. 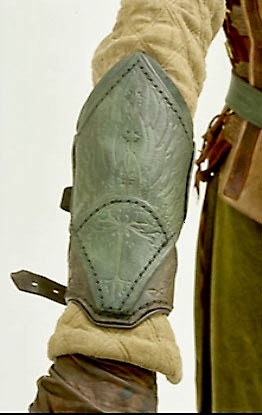 They really capture the "long bracer" look, seeming to come to the elbow. 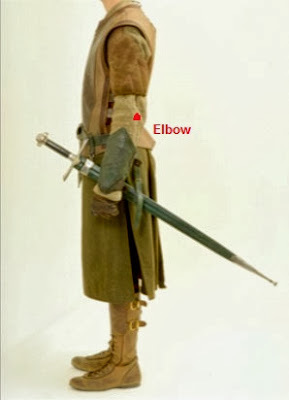 Note, that the armor curves steeply down, preserving the short inner-foream length (at least a fist-width from the joint) while flaring out at the elbow to look long. I'll post a detailed tutorial on re-creating "long" looking bracers later. All the parts of the tutorial are listed here. This is a great little tutorial and it's given me a few ideas. 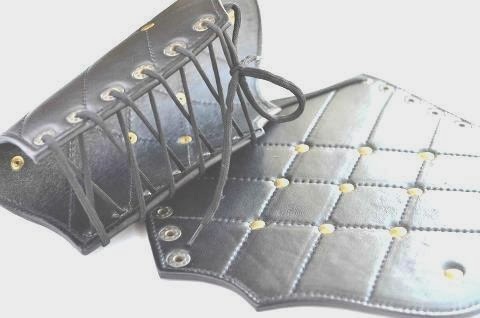 I want to make some like this, but with the laces/eyelets on the inner SIDE so that when I turn my wrist to hold and use my bow, they won't be in the way. Any idea how to change the pattern to do that? The simplest way to do this is draft your pattern out of paper (as described in this post), and tape it shut over your arm. With a marker, draw a line where you want the new opening/lacing to be. Then cut along the markered line, and lay it flat, this is your new pattern. Remember that the left and right sides are the inverse of eachother, when you are sewing them together, as when they are sidelaced, they are no longer interchangable. If you have any more questions, or if this was unclear, just let me know. You're right, that sounds pretty simple. I'm definitely going to give this a try in the next couple weeks. Thank you so much for taking the time to draw these diagrams. They're very helpful! I am a little confused with the visual width of my fist. 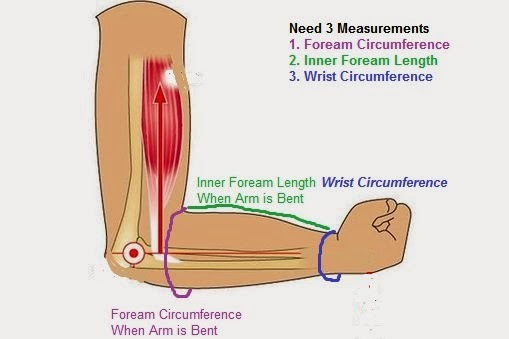 When getting the measurements for the bracer am I adding it to the the measurements of my arms or multiplying? Thanks. For A and B you are multiplying, for C you are subtracting. The visual width of your fist, is if you just make a fist and measure from your pinky knuckle to your index finger knuckle, plus maybe half an inch. I am trying to make Tauriel's arm bracers for a Halloween costume. Would I follow this pattern and just leave out the fist part? :) Thanks! It's so cool you are making them.